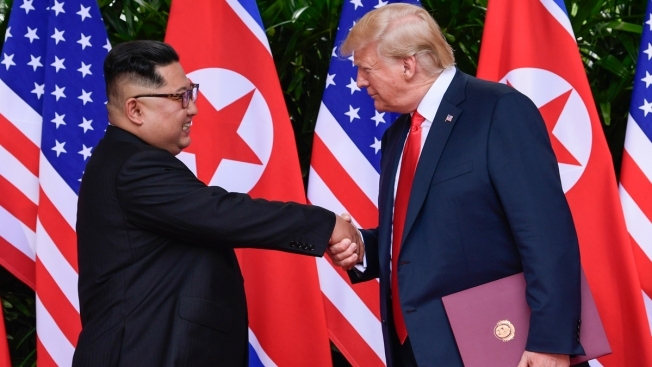 In this June 12, 2018, file photo, North Korea leader Kim Jong Un, left, and U.S. President Donald Trump shake hands at the conclusion of their meetings at the Capella resort on Sentosa Island in Singapore. To hear a beaming Donald Trump at his June summit with Kim Jong Un in Singapore, the solution to North Korea’s headlong pursuit of nuclear weapons, a foreign policy nightmare that has flummoxed U.S. leaders since the early 1990s, was at hand. To hear a beaming Donald Trump at his June summit with Kim Jong Un in Singapore, the solution to North Korea's headlong pursuit of nuclear weapons, a foreign policy nightmare that has flummoxed U.S. leaders since the early 1990s, was at hand. So even as Trump says he's keen on another summit, possibly early next year, continuing sanctions and pressure from Washington are met with anger and foot-dragging from Pyongyang, which has bluntly stated that an "improvement of relations and sanctions are incompatible." One of the problems is a matter of wording. The statement hammered out in Singapore, which called for "the complete denuclearization of the Korean Peninsula," was so vague that it seemed tailor made for a stalemate: Each side can claim to be right when they say that they've done more than enough and it's the other side's responsibility to act. Trump's national security adviser said such a meeting would not be a reward and that the president merely wants to give North Korea "a chance to live up to the commitments they've made at the Singapore summit." "He's held the door open for them, they need to walk through it," John Bolton said in an interview with NPR. "And this is one more chance for Kim Jong Un who is the only decision maker that matters in the North Korean system to deliver on what he said in Singapore, and that's possible I think some time after the first of the year." Other diplomatic channels have stalled, including talks between Trump and Kim's main envoys, U.S. Secretary of State Mike Pompeo and his North Korean counterpart Kim Yong Chol. Pompeo did meet on Thursday in Washington with South Korea's foreign minister in a new attempt to push the process forward. The State Department said only that the two officials "reaffirmed the ironclad alliance between the United States and (South) Korea and pledged to maintain close coordination to ensure the final, fully verified denuclearization of (North) Korea." Meanwhile, Pompeo's invitation for Kim to name a counterpart for his special North Korea envoy, former Ford Motor Co. executive Stephen Biegun, and send that person to Vienna for lower-level working discussions, has gone unanswered. South Koreans are famous for ignoring North Korean threats, including repeated vows to turn Seoul into a "sea of fire," but there were widespread fears of war last year amid threats and insults between Trump and Kim Jong Un as the North tested a string of increasingly powerful weapons. Even the most jaded would likely say that things are better now. There has also been curiosity at the warming ties between South Korean President Moon Jae-in and Kim, who have had three summits and agreed on an unprecedented trip to Seoul by Kim, possibly in coming weeks. Among the more stunning sights this diplomacy has spawned has been Moon, who has worked doggedly behind the scenes to orchestrate the various summits, filling a water bottle at a "sacred" volcanic lake in the North, and Kim being spirited across the inter-Korean border, the world's most heavily armed, in an armored limousine, a phalanx of burly bodyguards jogging alongside. But deep skepticism has always been the go-to mindset for many South Koreans, especially conservatives who have seen Moon's liberal presidential predecessors' engagement efforts with the North eventually fail to meet expectations. North Korea, it is true, has not conducted a nuclear or ICBM test since November 2017, but according to recent reports from private analysts it still is believed to be churning out nuclear bomb fuel and making headway on its missile program at more than a dozen facilities. Like the others, the latest such report, released on Thursday, is drawn from commercial satellite imagery and shows activity at a previously undisclosed site where the North is believed to be expanding a missile base. 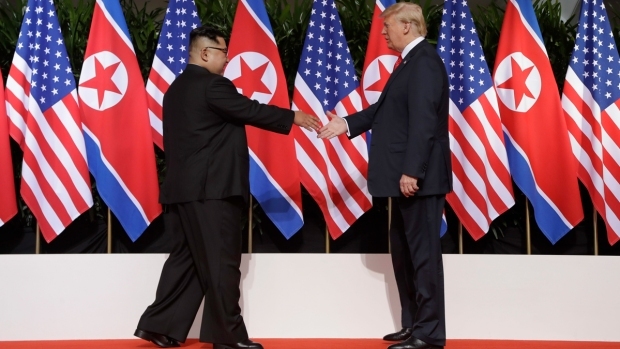 "The base is a strong candidate to receive North Korea's newest long-range missiles, including those that can strike the United States," wrote the report's authors at the Middlebury Institute of International Studies at Monterey. Moon's officials have pushed the narrative — and pushed aside skepticism from critics — that North Korea's suspension of nuclear and long-range missile tests and the dismantling of its nuclear testing site are meaningful steps toward an eventual total abandonment of nuclear weapons. They also briefly floated a proposal that Washington consider softer sanctions on the North. Conservatives in Seoul, however, believe that Kim's outreach is meant to split Seoul from Washington, its military protector, so that it will be harder for the allies to boost sanctions and pressure should diplomacy fail. Any Trump-Kim summit redux, they say, needs to be prefaced with at least a declaration from the North of the extent of its secretive missile and nuclear programs; otherwise, it would just be another concession to a country that has spent years ramping up tension only to reap rewards by seeming to turn to diplomacy. Still, in a place that has seen regular flare-ups of violence since the near-total destruction of the Korean War in the early 1950s, there's also interest in seeing if Trump and Kim can pursue in another summit a rare opportunity to test the sincerity of Kim's declaration that with his weapons program "complete," he intends to pivot to lifting his country up from poverty. 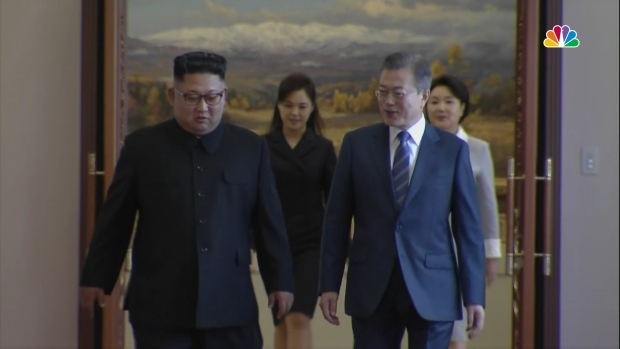 "With nuclear tensions on the Korean Peninsula dramatically reduced, it is time to find out if Kim's drive to improve the economy will eventually lead to denuclearization," Siegfried Hecker, a nuclear expert who has made regular trips to North Korea's nuclear facilities, wrote recently on 38 North, a website devoted to North Korea studies. "He may determine that his nuclear arsenal poses a significant hindrance to economic development that outweighs the putative benefits it confers. Washington and Seoul should work together to encourage rather than inhibit this potential shift."